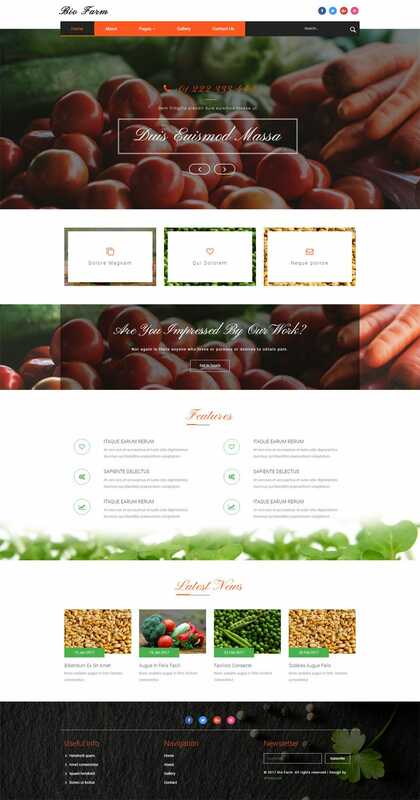 Bio Farm is an agriculture themed multipurpose template, a best solution for all your agriculture related websites in order to boost your profits and expand your agriculture business via online by using this modern and elegantly designed template. This smartly designed template is also a perfect choice for all your websites like dairy farms, eco product manufacturers, organic stores, cattle farms, agricultural business, meat and milk manufacturers, ecology, gardening, restaurant, lawn services, rural related businesses, agro tourism, bakery, eco-friendly lifestyle, Healthy Food Producers, Cattle-Farms, cake or flower shop, makeup products, Organic Beauty Stores, Shops of Natural Cosmetics, Organic Skincare Treatments website, coffee shop, cafe, pub, trattoria, bistros, pastry cook, dance hall, tavern and much more. This creatively designed template has awesome features like mesmerizing parallax effect, banner text slider, eye catching hover effects, attractive navigation bar, progressive sliding bars, gallery light box effect and very clean, sleek, minimalistic and elegance style of design in every detail. This template is 100% responsive cross browser template, compatible on all devices, displayed on all screen sizes. It is entirely built in Bootstrap framework, HTML5, CSS3 and JQuery. Make it yours now by using it, downloading it and please share it. Template Name : – Bio Farm an Agriculture Category Bootstrap Responsive Web Template. Date Created : – Apr 12, 2017. Source Files included: – HTML files (.html), Style Sheets (.css), Images (.jpg/png/gif),JQuery plugins (.js), Fonts (.ttf). Dec. 27, 2018, 9:34 a.m.
Life Time Free License Under Creative Commons Attribution 3.0 Unported. Unlimited Use, you can help &amp; support us (W3Layouts, a Non-Profit) by donations or you should keep link to our website.